You know that vacant wall in your school that everyone from students to your superintendent says “That wall really needs something!” or is this the year for The Legacy Project? Well, you’ve found the perfect something. 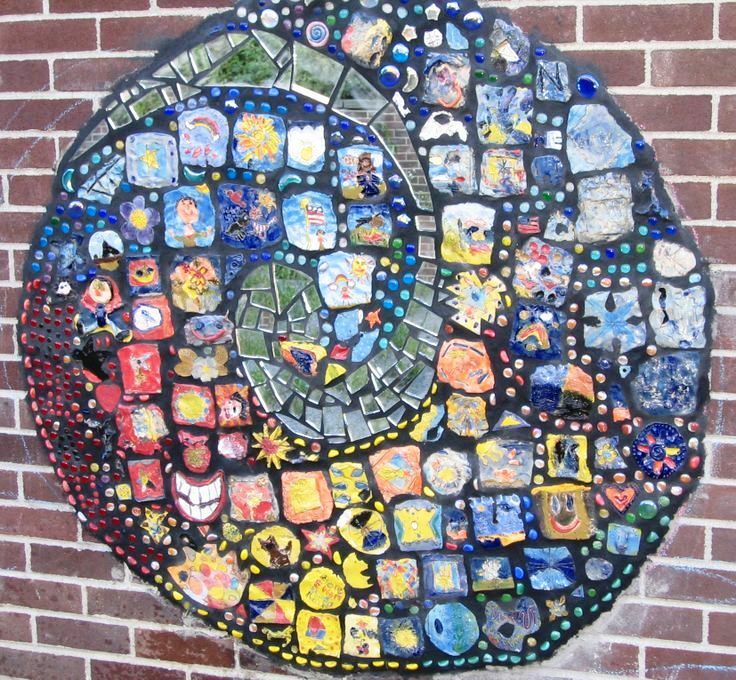 Clay for Kids has created over 35 murals in Alberta schools.. 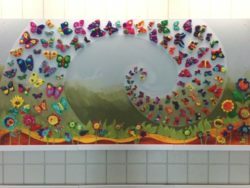 The entire school or just the graduating class will work together to create a beautiful permanent fixture for the school, to be marveled by everyone who passes by. Tile Murals can be installed both indoor and outdoor making the breadth of possibilities that much larger. The theme of the mural can be determined by us or we can consult with you and your staff given our spectrum of possibilities to design a breath-taking installation. 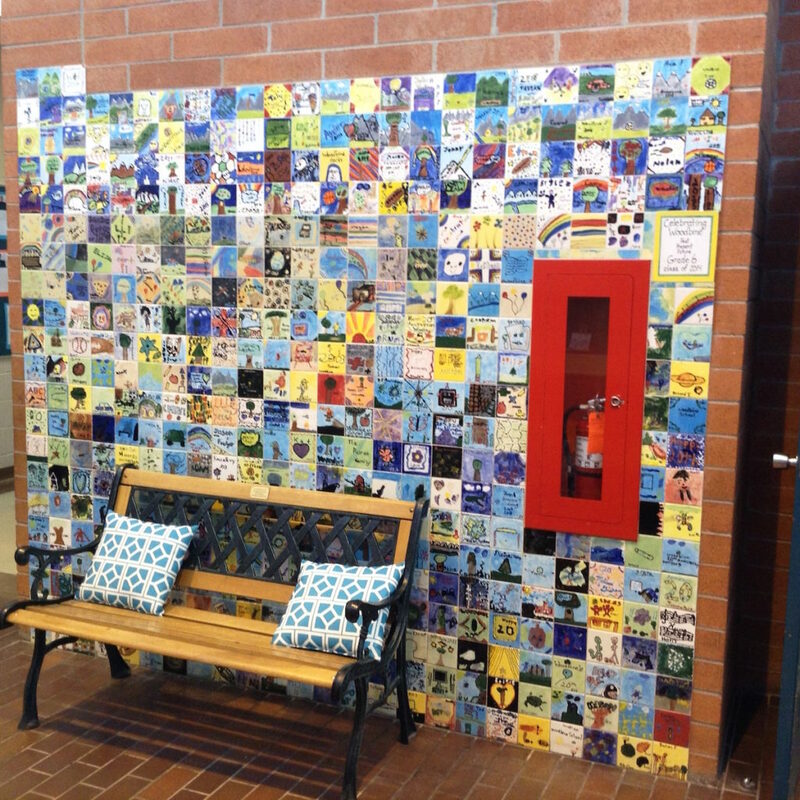 Graduating class wall tiles; Woodbine Elementary celebrates their grade six students by decorating a prefired 4″ clay tiles and Clay for Kids helps.Our instructor assists the students in the glazing and after the tiles are fired in our studio we mount and grout the tiles to a brick wall. Clay for Kids is an approved artist and you can find us online at the AFA website. We have a Master Agreement with the CBE. Supports the Social Studies curriculum to assist students in their journey to become responsible citizens and leaders of tomorrow. Is focused on Outcome 4.1 Alberta: A Sense of Land in the Grade 4 curriculum. Students demonstrate an understanding and appreciation of how elements of physical geography, climate, geology and paleontology are integral to the landscapes and environment of Alberta. Students learn how to develop a concept map that represents the physical geography of Alberta. Choosing a region to work on and deciding which flora, fauna, animal and/or geographic elements to recreate on their clay tiles. Deciding which colors to paint fired tiles to best show the regional theme. Coming to your school and bringing all required glass and other supplies. Glass is safe and easy to work with. Providing step by step instructions on how to make fused glass tiles. Firing the tiles in our studio kiln to 1350 degrees F.
Designing, cutting out and finishing a plywood base. Mounting and framing the tiles on the base. Returning the murals to the school within 21 days. Prices vary with the size of tiles and amount of glass used. In general, prices range from $18.00 plus GST per completed tile. 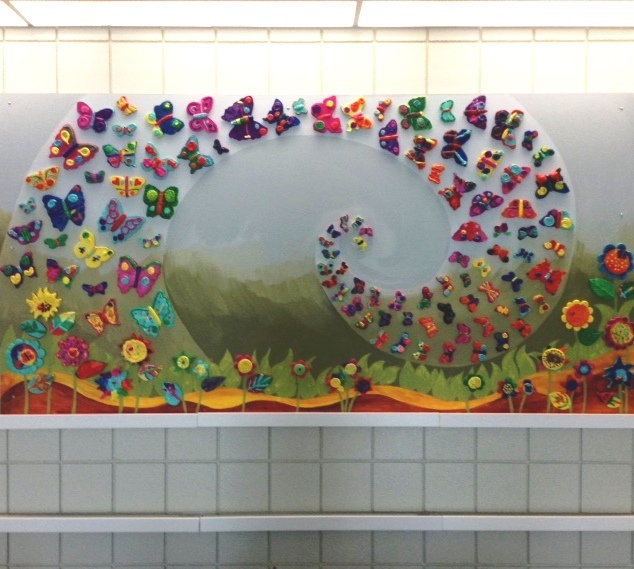 Click on Circle of Courage Mural to read about this mural that was completed for Keeler Elementary School in spring 2014. 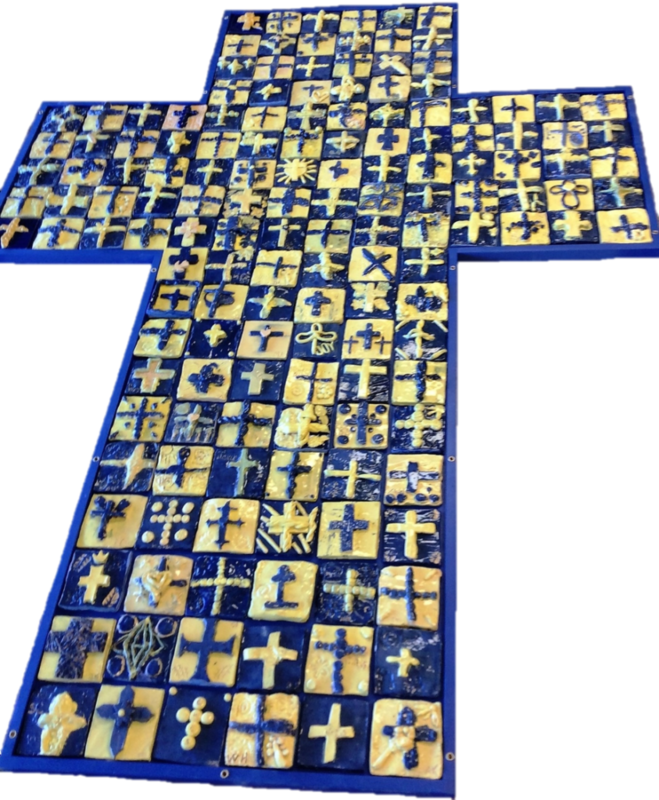 It is a strong visual confirmation of the school’s commitment to this program and is truly a work of art that was completed by the students and staff. Note: Selection of the location and the mounting of a wall mural are the responsibility of the school. 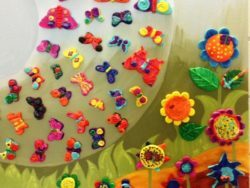 We can provide suggestions to assist with the installation.Clay for Kids is an approved artist for the Artist and Education Grant available through the Alberta Foundation for the Arts. 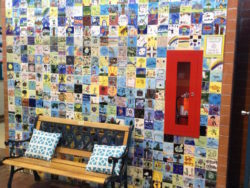 For more information, see the Tile Mural FAQ’s. 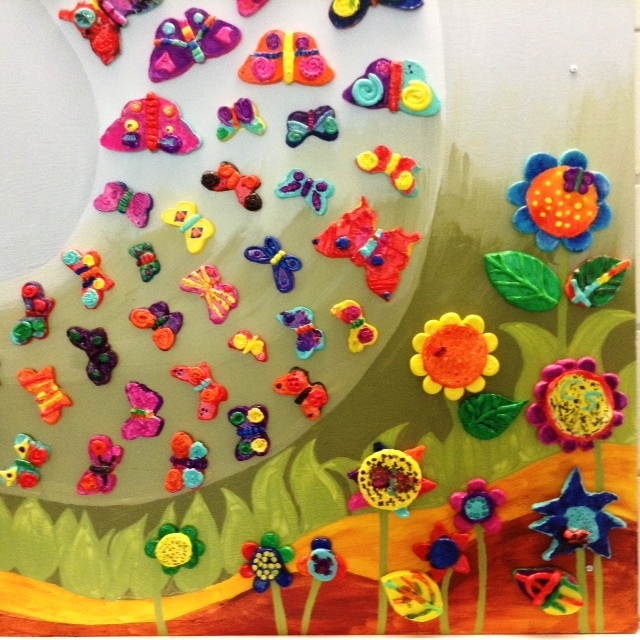 Clay for Kids is on the arts roster for visual arts. How far in advance do we need to start planning? The earlier the better; we recommend getting started the school year before your desired timeframe. This gives all parties ample time to prepare. The grant writing and approval process can be lengthy and planning in advance also gives you a better chance at locking down the best date. Grants are accepted by April 2 of each new year. When accepted the work can begin the following school year. 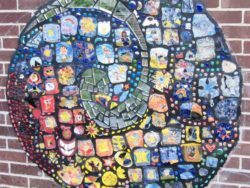 How many classes can Clay for Kids work with in one day? Generally, we prefer to work with four to six classes a day. Which age groups or grade levels can Clay for Kids work with? Any and all; Kindergarten to High School. How big of a school is too big? No school is too large. We have accommodated schools with populations over eight hundred. Larger programs will generally take an additional week for each workshop. What finishes can we chose? We offer two styles of murals – one is finished in an acrylic paint finish with clear high gloss varnish painted on to protect the tiles. This mural is for indoors only. Costs start at $16.00 per tile( depending on complexity of design), or shape. The second is finished with a slip glaze high gloss finish. 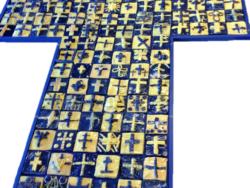 Each tile is designed and made by the students and then immediately slip glazed with a liquid clay base paint. The tiles are dried, fired and dipped in clear glaze to a hard shiny finish. Cost is $18 per tile depending on complexity of design.